While writing the pages on Ugolino della Gherardesca in The Undivine Comedy (1992), my analytical lens shifted from the meta-narrative to include more historicist material (see pp. 96-97). In retrospect I realize that writing these pages was perhaps the first time I experienced in practice how detheologizing clears the way for historicizing, long before I understood in theoretical terms how this is in fact the case. In making the case for historicizing, I do not mean to suggest that history has not been used in considerations of the Commedia, but to indicate that we can see the possibilities for historicist readings in a fresh light once we are less blinkered by an overdetermined hermeneutic template engineered by the author to prescribe our readings. Thus, in the essay “Only Historicize” (2009), I give the example of the still under-explored historical context of Ugolino, in particular stressing that the Ugolino episode is the Inferno’s most painful and explicit exploration of the role of family in politics: “Dante’s thinking on the role of the casato as a key to the tragedy of Italian history is an unexplored feature of the Ugolino episode” (“Only Historicize,” p. 49). The Guelph Visconti and Ghibelline Gherardesca families, traditionally opposed, became allies to protect their Sardinian holdings. Their alliance led to the ill-fated shared magistracy of Ugolino and his grandson Nino Visconti, the same Nino whom Dante hails as a personal friend in the Valley of the Princes, calling him by his Sardinian title “giudice Nin gentil” (Purg. 8.53). Nino’s title is “giudice” because the provinces of Sardinia were called “giudicati”. no need to have his sons endure such torment. The sin that puts Ugolino in Antenora is not specified by Dante; this may or may not be because his sin was obvious to contemporary readers, for the early commentators do not all agree on what the sin might be. Ugolino was more of a diplomat than a warrior and his achievements can easily be construed as betrayals: for example the ceding of the castles, a gesture designed to break the alliance between Pisa’s enemies, was in fact a successful act of diplomacy. In other cases, his “betrayal” may seem much more obvious to modern readers if not contemporaries, for example when he went to war against the city of Pisa as head of a group of noble “fuoriusciti” and won (like Farinata). Finally: would his “conversion” to the parte guelfa be considered a political betrayal? It is not clear. According to all the historical accounts I have read, including relatively recent research (Il conte Ugolino della Gherardesca tra antropologia e storia, ed. Francesco Mallegni and Maria Luisa Lemut, Pisa 2003), Ugolino cannot be said to have “led” the Pisan forces, although he did participate in the battle. However he was later and often blamed for the defeat, considered to be the start of Pisa’s permanent decline. Furthermore, Ugolino was elected because of this defeat, not in spite of it, precisely because the election of a known Guelph would appease Pisa’s Guelph enemies and provide a suitable interlocutor with whom they could negotiate the terms of peace. I agree with the view that the betrayal for which Dante chiefly held Ugolino responsible may be traced back to his treatment of his grandson Nino Visconti during the period in which they shared power in Pisa. I consider the presence of Nino Visconti in Purgatorio 8, and the deep affection displayed between him and Dante in that canto (an affection for which we have no independent verification), a signpost regarding Nino’s importance in recent Pisan history as Dante saw it. Chiavacci Leonardi too writes that it is implausible that Ugolino’s true betrayal from Dante’s perspective was the ceding of the castles and that it was more likely something to do with his “betrayal” of Nino: “Ma il vero tradimento per cui egli sta nell’ultimo cerchio non sembra poter essere questo, se era solo una voce. Si tratta più probabilmente del suo improvviso voltafaccia quando era signore della città, per cui tradì Nino Visconti accordandosi con l’arcivescovo Ubaldini, secondo una versione da Dante seguita” (The true betrayal committed by Ugolino, for which he is placed in the lowest circle, is most likely not this [the ceding of the castles], given that this was only a voce or rumor. Most likely it was the sudden turnabout when he was lord of the city, whereby he betrayed Nino Visconti and allied himself with Archbishop Ubaldini, according to the version of events that Dante followed [Chiavacci Leonardi commentary to Inferno 33, at verse 86, my trans.). In Dante’s view, Ugolino used and abused his family members in securing and consolidating power over Pisa. Thus, Dante shows the fictional Ugolino’s willingness to use his children as oratorical pawns in his infernal narrative. However murky the politics and history of the Ugolino episode, the story as Dante tells it is fundamentally about the exploitation of the bonds of family love for political ends. This form of exploitation, while taken to the extreme in Ugolino’s case, was systemic in Dante’s society. We cannot stress the last point enough: the story of Ugolino is an emblem for the systemic exploitation of family to political ends in Due- and Trecento Florentine society. Such exploitation was built into the dynastic model: families were units of power and governance and Ugolino’s story demonstrates the dire consequences that may result when family ties are systemically subordinated to the requirements of power. The Ugolino encounter foregrounds dynastic power politics and shows how it leads to abuses of all human relationships—even the bond between parent and child. The Inferno is full of dynastic families, discussed as a historical phenomenon in the Introductions to Inferno 5, Inferno 12, and Inferno 27. Just to focus on two canti that have many internal recalls and links between them, Inferno 5 and Inferno 33, we saw the exploitation of women for dynastic purposes in Inferno 5: Francesca da Polenta was married to Gianciotto Malatesta as a dynastic pawn to consolidate the ruling Polenta family of Ravenna and the ruling Malatesta family of Rimini. In Inferno 33 Dante is again reminding us that all members of a powerful family are usable, including children, and that all members, including children, may potentially suffer. Antenora is reserved for political traitors while Caina is for traitors of family, but the story of Ugolino and his sons, like that of Francesca da Rimini, indicts Italian politics for not distinguishing between the two. Indeed, the indictment is twofold: family bonds are systematically used in order to advance politically; family bonds are systematically abused when the family members in question are politically counter-productive. Dante’s account of Ugolino della Gherardesca and his sons thus dramatizes the subordination of love to power. In this encounter with the last great charismatic sinner of Inferno, we come back to love: paternal rather than romantic, but definitely love. As occurs in Inferno 5, which moves from its topic (love) to its meta-topic (reading and writing about love), so also Inferno 33 moves from its topic, the family/power nexus, to its meta-topic: the question of communication and language and, most importantly, the question of our responsibility to use language to comfort each other. The Ugolino episode is an in malo expression of the principle, strongly held by the author of the Commedia, that we have an obligation to speak to each other: a sacred responsibility to use the special human birthright of language to help, guide, and console each other. Language used to comfort and console is indeed a major theme of my commentary on Inferno 2, titled Beatrix loquax and Consolation. Beatrice says “Amor mi mosse, che mi fa parlare”: “Love prompted me, that Love which makes me speak” (Inf. 2.72). you now shall hear and know if he has wronged me. As Francesca tells of the private romantic moments that led to her falling in love with her brother-in-law, moments that no one else now knows, since the other participant in the event is dead, so Ugolino tells of the private torturous moments that led to his death by starvation, after witnessing the starvation one by one of his children. There is no denying the horror to which Ugolino was subjected and, moreover, it is impossible for any of us readers to know with certainty how we would behave under such circumstances. Therefore, faced with such a story (the only story in Inferno that focuses at length on the manner of death), a certain moral pudor seems obligatory. But the rules of Dante’s parlor game involve responding to what we see (as the pilgrim does), and participating morally in what we read. Humans are gifted by their maker with reason, and with reason they were able to create language. In this scheme of things, the scheme of things that Dante posits, language is our fundamental privilege and our fundamental responsibility. As Dante feels obliged to seek heroically to use language to describe the indescribable in the exordium of Inferno 32, so Ugolino was obliged to seek heroically to use language to express the inexpressible to his children. Instead, Ugolino’s heart turns to stone—“sì dentro impetrai” (within, I turned to stone [Inf. 33.49])—and his tongue dries up, as Dante fears his tongue will do when he first addresses Ugolino (see Inf. 32.139). The verb impetrare, to turn to stone, echoes the rima petrosa that informs Inferno 32, signalling again that the cold and love-denying ethos of the petrose prevails. How talkative Ugolino is now, to the pilgrim, how willing to communicate his point of view and his sense of his own pain, and how he failed utterly to offer a word of consolation to his dying children! Dante goes so far as to revise the historical record, making Ugolino’s historically grown sons and grandsons into children, in order to generate pathos and reveal the stony-heartedness of the father. The children offer more comfort to the father—they speak more words to him—than the father does to them. Ugolino’s discourse to Dante is extremely well structured, as Bàrberi Squarotti showed in his classic essay “L’orazione del conte Ugolino,” (cited in Coordinated Reading), and deeply manipulative. I find most chilling the logical connectors with which he indicates that he had no choice but to keep silent, as in “Perciò non lagrimai né rispuos’ io” (Therefore I shed no tears and did not answer [Inf. 33.52]) and “Queta’mi allor per non farli più tristi” (Then I became silent, so that I not make them more sad [Inf. 33.64]). But why would words make them more sad? They are humans, not the wolf-cubs of Ugolino’s dream. And, indeed, the children speak their grief to the father. It is the father who does not speak to them. Ugolino sees himself in dream as a wolf being hunted with its cubs: he is ‘‘il lupo’’ with its ‘‘lupicini’’ (Inf. 33.29). The wolf holds a particular place in Dante’s imaginary, and, by characterizing the Count as a wolf, Dante signals that Ugolino is a figure of rapacious greed, whose hunger for power was his paramount feeling and motivation. The lupa of Inferno 1 is a fearsome figure of lack. As the masculine variant of la lupa, Ugolino is the father who inflicts on his sons fearsome lack: material lack and starvation in the tower, but also spiritual lack of language and comfort and consolation. e li altri due che ’l canto suso appella. so that it may drown every soul in you! the other two my song has named above! Dante’s explicit reference to the sons as innocent on account of their youth—“Innocenti facea l’età novella” (their youth made them innocent [Inf. 33.88])—suggests that he might have altered their actual ages (if he had this information) in order to insist on the innocence of youth. The innocence of youth is not a given in societies that treat all members of a tribe as standing or falling with their tribe. Once again, as in the Geri del Bello episode in Inferno 29, Dante takes a stand against violence that is justified through family and kinship. In Inferno 29 he rejected the logic whereby he himself had to become a killer to avenge the violent death of his kinsman. In Inferno 33 he rejects the logic whereby Ugolino della Gherardesca’s male sons are killed along with their father. that gift, that one may pray to Him for it! By the same token that virtue does not pass down genealogically, neither does sin: Guido da Montefeltro is damned, while his son Bonconte is saved (see Purgatorio 5). Ugolino’s sins should not have been visited upon his sons. 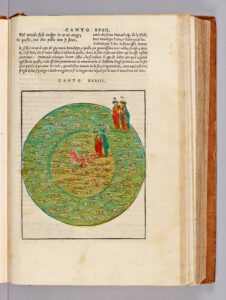 Radically, Dante counters the logic of tribe and family and insists that the sons’ youth guarantees their innocence: “Innocenti facea l’età novella” (88). In a society where dynastic politics leads to the imprisonment and killing of children, this is a strong statement. One wonders, however: at what age exactly does a family member cease to be innocent? At what age does the logic of the tribe engulf him? At what age does he become, simply by virtue of his position in a family, nocent? After these bitter words, Dante turns his back on Ugolino, and the canto moves onward. At the end of Inferno 33 the travelers move on to Tolomea, the third zone of Cocytus, reserved for traitors of guests. The story of Frate Alberigo and his companions in Tolomea is a remarkable one. It is, moreover, theologically untenable. Dante learns that the souls of Tolomea have a peculiar fate: their bodies still walk the earth while their souls are already dead. Most remarkable is the case of Branca Doria. Branca Doria did not die until 1325, four years after Dante’s own death in 1321. Dante-poet here stages the bewilderment of Dante-pilgrim, who believes he is being deceived when Frate Alberigo points to Branca Doria. How can Branca Doria be here in Hell when he is still alive? In The Undivine Comedy, the notes offer a reference to the tradition that grew up, according to which Branca took revenge on the poet for putting him in Hell by having him beaten (see Undivine Comedy, p. 297, note 45). The existence of such a tradition shows that: 1) the Commedia circulated enough in Dante’s lifetime that contemporaries could imagine a person who wants to avenge himself on the poet; 2) Dante’s readers were at some level aware of the outrageousness of what Dante does in placing Branca Doria in Hell while he was still alive. These sinners are medieval versions of the modern “zombie”: their bodies on earth are animated corpses. The theme of animated death is a governing one in lowest Hell, and it will dominate the treatment of Lucifer in Inferno 34. Dante ventures onto very thin ice indeed—theologically speaking—when he damns folks who have not yet died in 1300. He has already gone in this dangerous direction in two instances. We noted the flagrant case of Pope Boniface VIII, whose arrival in the bolgia of simony after his death in 1303 is predicted in a highly dramatic encounter with Pope Nicholas III in Inferno 19. There is also the case of Fra Dolcino, the heretic who died in 1307 and whose arrival in the bolgia of the schismatics is predicted by Mohammed in Inferno 28. Now Dante does it again, flouting theology in order to make a dramatic point: certain kinds of iniquity are so great that a soul goes to Hell while the soul’s body is still on earth. 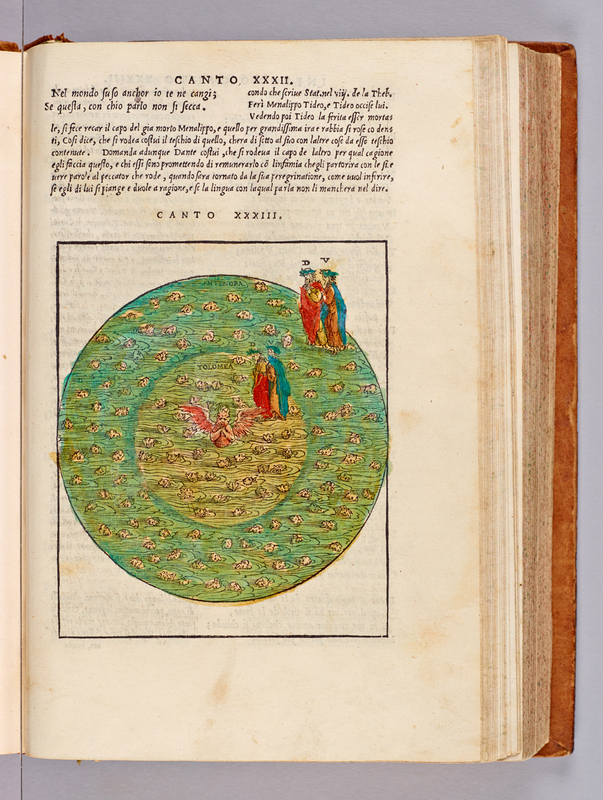 The particular contours of this case—the spectacular idea of the animated corpse that remains on earth and the soul that goes to Hell the very second that it betrays—are such that Dante here connects to the domain of popular piety. Hence my use of the word “zombie” above, intended to remind my readers of the provocatively popular and Halloween-like nature of what Dante chooses to do in Inferno 33. For all the Halloween-like nature of Dante’s invention of the already-dead-while-still-apparently-alive, there is also a serious theological perspective to be taken into consideration. Dante is effectively saying that some sins cause the sinner to be damned while still alive, despite a theology of repentance that holds that there is never a day before death when salvation is beyond our grasp. So Dante has deprived frate Alberigo and Branca Doria of the fundamental “right” to repent for their sins up to the last moment of life. As I have written previously in this commentary, Dante here flirts with the very determinism of which Cecco d’Ascoli accused him. See the discussion of Cecco d’Ascoli’s accusation in the Appendix to the commentary on Inferno 7 and also the discussion of determinism in the commentary on Inferno 20. Dante is here troping his master fiction: instead of living dead people, we now must contend with the idea of dead living people. As the outlines of the fiction become harder to hold onto, we succumb to it more readily, especially when the text reproduces our relation to it within itself, as occurs in the ensuing dialogue between the pilgrim and Alberigo: it seems that Branca Doria, a Genovese nobleman condemned to the ninth circle for the murder of his father-in-law, Michele Zanche (a Sardinian whom Dante has placed among the barraters), is in fact dead. The pilgrim is incredulous; Alberigo must be lying: “‘Io credo’, diss’io lui, ‘che tu m’inganni; / ché Branca Doria non morì unquanche, / e mangia e bee e dorme e veste panni’” (“I believe”, I said to him, “that you deceive me, / for Branca Doria has not yet died, / but eats and drinks and sleeps and puts on clothes” [Inf. 33.139-41]). When the pilgrim disbelieves what he is told, essentially saying that he cannot sustain disbelief to such a degree, frate Alberigo, the fictional character, appeals to the “reality” of the virtual world that Dante-pilgrim has witnessed. At the end of Inferno 33, after having dramatized the scene in which a sinner had to persuade him to believe what he saw, the poet is able to state simply and categorically that in the ninth circle he found—“trovai” (155)—a spirit whose soul was in Cocytus, while his body was on earth. This passage is thus a master class on how to manage and massage the reader’s suspension of disbelief. Coordinated Reading: The Undivine Comedy, Chapter 4, “Narrative and Style in Lower Hell,” pp. 94-97; “Dante and Francesca da Rimini: Realpolitik, Romance, Gender,” Speculum 75 (2000): 1-28; “Only Historicize,” Dante Studies, 127 (2009): 37-54 (especially pp. 44, 49); “A Philosophy of Consolation: The Place of the Other in Life’s Transactions,” in Boccaccio 1313-2013, ed. F. Ciabattoni, E. Filosa, K. Olson (Ravenna: Longo, 2015), pp. 89-105; Bàrberi-Squarotti, Giorgio, “L’orazione del conte Ugolino,” Lettere Italiane 23 (1971): 3-28. 3del capo ch’elli avea di retro guasto. 6già pur pensando, pria ch’io ne favelli. 9parlar e lagrimar vedrai insieme. 12mi sembri veramente quand’ io t’odo. 15or ti dirò perché i son tal vicino. 21udirai, e saprai s’e’ m’ha offeso. 27che del futuro mi squarciò ’l velame. 30per che i Pisan veder Lucca non ponno. 33s’avea messi dinanzi da la fronte. 36mi parea lor veder fender li fianchi. 39ch’eran con meco, e dimandar del pane. 42e se non piangi, di che pianger suoli? 48nel viso a’ mie’ figliuoi sanza far motto. 51disse: “Tu guardi sì, padre! che hai?”. 54infin che l’altro sol nel mondo uscìo. 63queste misere carni, e tu le spoglia”. 66ahi dura terra, perché non t’apristi? 69dicendo: “Padre mio, ché non m’aiuti?”. 74e due dì li chiamai, poi che fur morti. 75Poscia, più che ’l dolor, poté ’l digiuno». 78che furo a l’osso, come d’un can, forti. 84sì ch’elli annieghi in te ogne persona! 87non dovei tu i figliuoi porre a tal croce. 90e li altri due che ’l canto suso appella. 93non volta in giù, ma tutta riversata. 99rïempion sotto ’l ciglio tutto il coppo. 104per ch’io: «Maestro mio, questo chi move? 105non è qua giù ogne vapore spento?». 108veggendo la cagion che ’l fiato piove». 114un poco, pria che ’l pianto si raggeli». 117al fondo de la ghiaccia ir mi convegna». 120che qui riprendo dattero per figo». 121«Oh», diss’ io lui, «or se’ tu ancor morto?». 123nel mondo sù, nulla scïenza porto. 126innanzi ch’Atropòs mossa le dea. 132mentre che ’l tempo suo tutto sia vòlto. 135de l’ombra che di qua dietro mi verna. 138poscia passati ch’el fu sì racchiuso». 141e mangia e bee e dorme e veste panni». 147che ’l tradimento insieme con lui fece. 150e cortesia fu lui esser villano. 153perché non siete voi del mondo spersi? 157e in corpo par vivo ancor di sopra. in back: he wiped his lips upon its hair. even as I think back, before I speak. I gnaw, you’ll see me speak and weep at once. from what I hear—to be a Florentine. and now I’ll tell you why I am his neighbor. which rent the curtain of the future for me. Gualandi and Sismondi and Lanfranchi. I seemed to see their flanks torn by sharp fangs. weeping within their sleep, asking for bread. and if you don’t weep now, when would you weep? I looked into the faces of my sons. I did not weep; within, I turned to stone. until another sun had touched the world. O hard earth, why did you not open up? who were not bent, but flat upon their backs. the hollow that is underneath the eyebrow. “My master, who has set this gust in motion? my body’s fate within the world above. it has been thrust away by Atropos. until its years have run their course completely. a devil in his stead inside his body. and it was courtesy to show him rudeness. why have you not been driven from the world? and up above appears alive, in body. And weep’st thou not, what art thou wont to weep at ? Which, as a dog’s, upon the bone were strong. That every person in thee it may drown ! Guiltless of any crime, thou modern Thebes ! And the other two my song doth name above ! Whence I: “My Master, who sets this in motion ? And still above in body seems alive ! We see the second ring of the Ninth Circle, Antenora, where traitors to the homeland are punished, and the third circle, Ptolomea, where reside traitors to their guests. 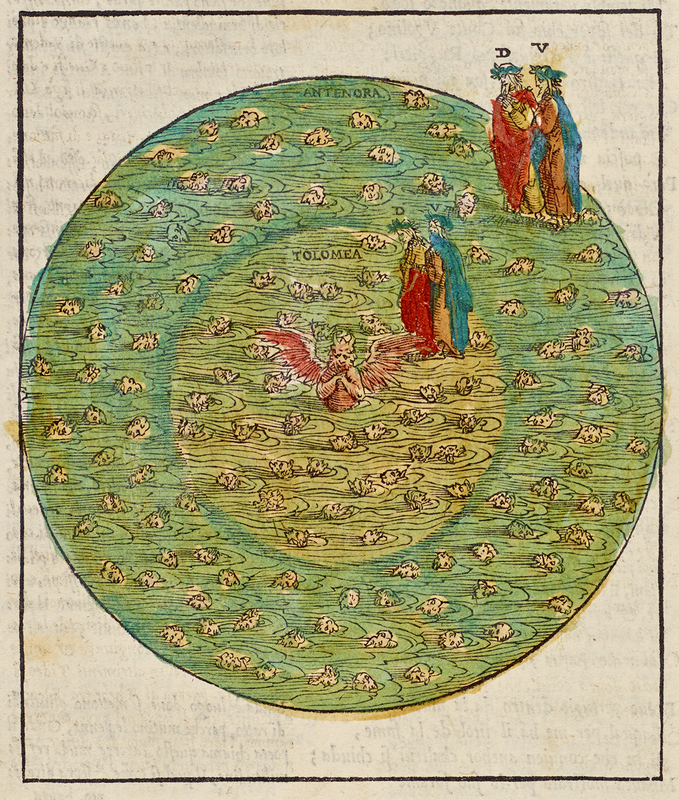 A small image of Lucifer appears at the center. Dante and Virgilio speak with Fra Alberigo who informs them that Ptolomea has the power to take a soul to hell even while the body remains on Earth, using Dante’s acquaintance, Branca Doria, as an example.